Music Editor Free is a handy software that helps to edit soundtracks by adding various sound effects. 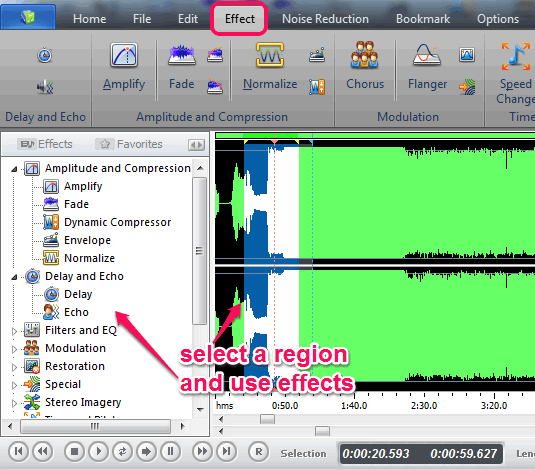 It lets you apply amplify effect for selected region, normalize effect, echo effect, speed change effect, and more. You can even preview any effect before applying it. Apart from this main task, you can mix different audio files and can generate a single mix up file. Not only this, it is helpful to extract unwanted part from an audio file. This feature is also beneficial to create ringtones. This free music editor also helps to record sound (requires Microphone) for editing or else you can add any supported music file. A text to speech feature is also available, but unfortunately it didn’t work for me. 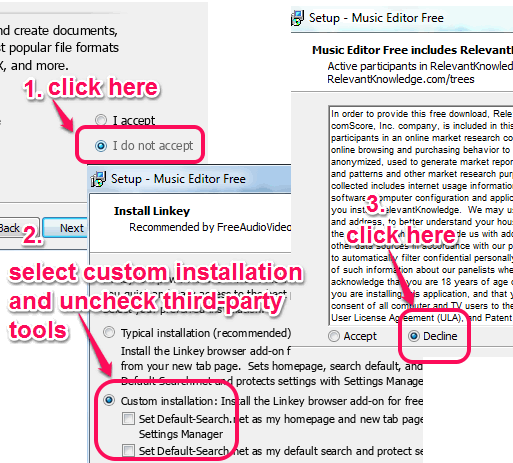 Interface of this free music editor is visible in above screenshot. 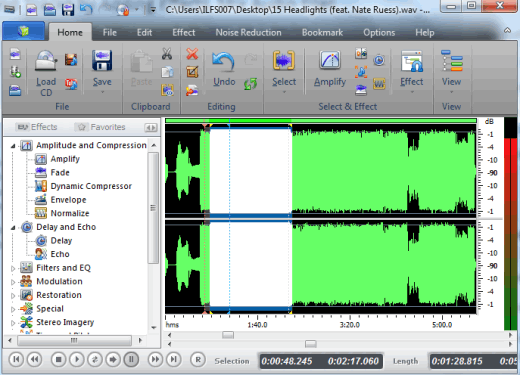 Right part shows waveform mode of input audio file, left part shows audio effects that can be applied. Similar Software: Nero WaveEditor and Jokosher. How To Use This Free Music Editor? This music editor opens with a welcome window. This welcome window lets you choose a type of task you can perform, such as: record an audio for editing, add a new audio file, load audio from CD, and Text to Speech conversion. 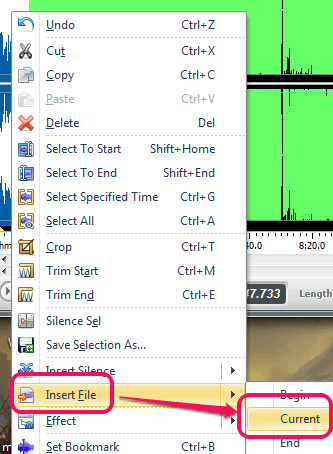 If you have to edit audio file available on PC, simply use New File option. After this, you will come to the main interface of this music editor. You can use Home tab/File tab to add any mp3 file, wav, mp2, ogg, aiff, mpc format, CD audio track, wma, or raw format audio file. After adding the input file, you can see waveform of input audio at right side. Now simply select a specific region of audio file to apply effects. If you want to apply effects in whole file, then no need to select any region. The most interesting thing here is that you can first preview any individual effect before actually applying it to your sound file. Moreover, presets with each individual effect are also present. So if you don’t have much idea to change depth of any effect manually, you can use presets. Amplify Effect: that helps to increase or decrease the volume of selected region. Echo Effect: using this effect, you can add reflection of sound to selected region and can also set delay time for that region. Fade in/Fade out effect to slow down and slow up volume for any particular region. Speed Change Effect: that lets you change speed of selected region without changing the sound pitch. Pitch Change Effect: to adjust pitch without changing sound speed, etc. Effects can be added in three different ways: using right-click context menu, using left part of its interface, or by accessing Effect tab. 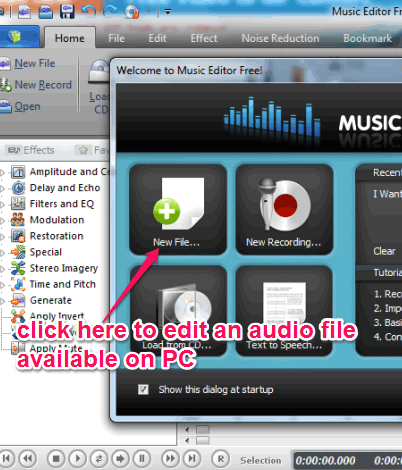 Edited audio file can be saved to PC as wav, ogg, wma, or mp3 file. You can create a mix up audio file of different audio files. For this, first select a region of input audio file. Now right-click on that file and access Insert File option. After this, you can use Current option to insert another audio file in selected region. If you don’t want to insert the whole file, then you have to trim the unwanted part after insertion. A selected region can also be saved as a separate audio file. Or else, you can add any selected region to beginning or at the end of your sound track. Noise reduction feature is also available that can reduce voice breath noise reduction or you can manually reduce threshold and other values. A selected region can also be bookmarked for later use. Music Editor Free is full with features to edit sound tracks and apply multiple effects to audio files. For all music lovers who want to produce a creative sound track, this could be an interesting music editor.